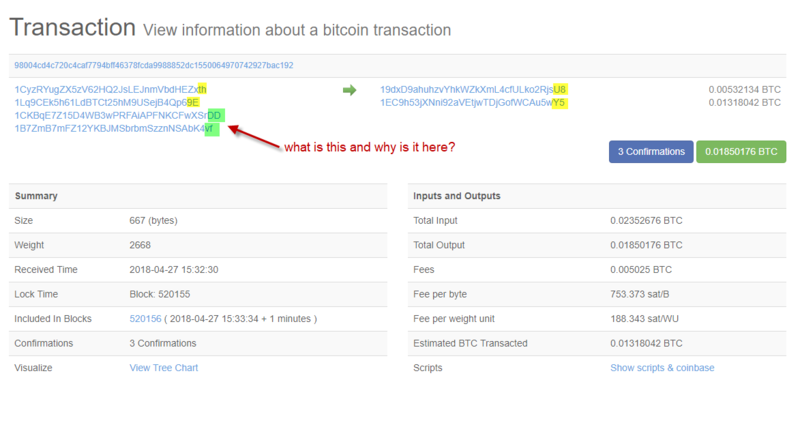 I'd like to know how to read a 'transaction', so if we take an example of this transaction (which comes from block #520156) it's easy to spot that 'th' paid 'U8' 0.005BTC and '9E' paid 'Y5' 0.013BTC. but what are what are the 'DD' and the 'vf' for (marked in green)? When you send a Bitcoin transaction, your wallet software will use one or more existing Unspent Transaction Outputs (UTXO) to fund the transaction. The transaction will then specify the new owners of the consumed balance in the outputs. If the amount spent in the inputs does not match the amount in the outputs plus fees perfectly, the remainder will be sent back to the sending wallet in a change output. This particular transaction appears to have spent four UTXO to pay a single recipient, sending back the remainder of the input balance to the sender. Alternatively, this transaction may have paid two recipients, but that is not the most common pattern on the blockchain today. Anyway, while multiparty transactions exist on the network (e.g. look at coinjoin here on the site), they are fairly uncommon today. Not the answer you're looking for? Browse other questions tagged transactions payment transaction-input or ask your own question. How instantaneous is a Bitcoin transaction?